Bakhshizadeh, S., Taghizadeh, A., Janmohammadi, H., Alijani, S. (2014). Chemical composition and the nutritive value of pistachio epicarp (in situ degradation and in vitro gas production techniques). Veterinary Research Forum, 5(1), 43-47. Somayeh Bakhshizadeh; Akbar Taghizadeh; Hossein Janmohammadi; Sadegh Alijani. "Chemical composition and the nutritive value of pistachio epicarp (in situ degradation and in vitro gas production techniques)". Veterinary Research Forum, 5, 1, 2014, 43-47. Bakhshizadeh, S., Taghizadeh, A., Janmohammadi, H., Alijani, S. (2014). 'Chemical composition and the nutritive value of pistachio epicarp (in situ degradation and in vitro gas production techniques)', Veterinary Research Forum, 5(1), pp. 43-47. Bakhshizadeh, S., Taghizadeh, A., Janmohammadi, H., Alijani, S. Chemical composition and the nutritive value of pistachio epicarp (in situ degradation and in vitro gas production techniques). 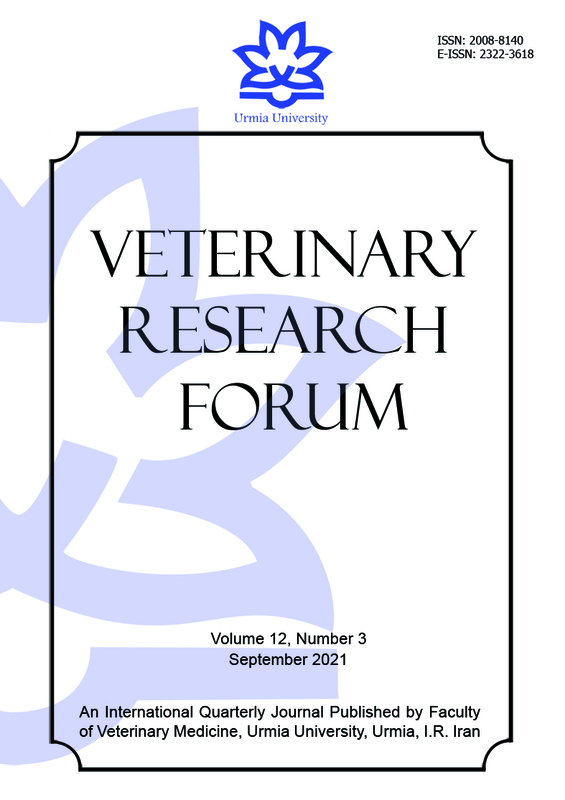 Veterinary Research Forum, 2014; 5(1): 43-47. The nutritive value of pistachio epicarp (PE) was evaluated by in situ and in vitro techniques. Chemical analysis indicated that PE was high in crude protein (11.30%) and low in neutral detergent fiber (26.20%). Total phenols, total tannins, condensed tannins and hydrolysable tannins contents in PE were 8.29%, 4.48%, 0.49% and 3.79%, respectively. Ruminal dry matter and crude protein degradation after 48 hr incubation were 75.21% and 82.52%, respectively. The gas production volume at 48 hr for PE was 122.47 mL g-1DM. As a whole, adding polyethylene glycol (PEG) to PE increased (p < 0.05) gas production volumes, organic matter digestibility and the metabolizable energy that illustrated inhibitory effect of phenolics on rumen microbial fermentation and the positive influence of PEG on digestion PE. The results showed that PE possessed potentials to being used as feed supplements. Due to shortage of water and locally produced feeds in many developing and underdeveloped countries, livestock often suffer from under-feeding and malnutrition. Thus, better utilization of non-agricultural by-products which do not compete with human foods is imperative. One of the agro-industrial co-products is pistachio epicarp (PE) which offers some promises of overcoming this problem. In Iran, production pistachio by-products (PB) exceeds 400,000 tons per year.1 The nutritive value of PE varies depending on variations in the pistachios cultivars, growing practices, kernel maturity and the de-hulling process. The crude protein (CP) content of PB varies from 92 to 120 g kg-1 on a dry matter (DM) basis and the metabolizable energy (ME) content of PB may vary from 7.10 to 7.50 MJ kg-1 DM.2 However, PE have been reported to contain high levels of tannins in both hydrolysable and condensed forms.3 Therefore, the value of PE for ruminants is offset by their potentially negative effects on protein utilization, and the risk of toxicity when intake is high.4 Polyethylene glycol (PEG), a non-nutritive synthetic polymer, has a high affinity to tannins and can make them inert by forming tannin-PEG complexes.5 Polyethylene glycol can also liberate protein from tannin–protein complexes and/or prevent their formation.6 Therefore, PEG has been used to mitigate adverse effects of tannins on rumen fermentation. The aim of the current study was to assess the chemical composition and nutritive value of PE using in situ and in vitro gas production techniques. Pistachio epicarp. Fresh PE (Pistacia vera) was collected from pistachio plant cleaning factories of Ghazvin, Iran. Samples were oven-dried at 50˚C for 48 hr and stored in sealed plastic bags. Samples were milled through a 2 mm screen for in situ analysis, in vitro gas production and chemical analysis. Chemical composition. Pistachio epicarp dry matter (DM, Method ID 934.01), ash (Method ID 942.05), ether extract (EE, Method ID 920.30) and crude protein (Method ID 984.13) were determined by procedures of Association of Official Analytical Chemists (AOAC).7 The NDFand ADF concentrations were determined using the methods of Van Soest et al. without sodium sulphite.8 The NDF was analyzed without amylase with ash included. Total phenolics (TP) were measured using Folin Ciocalteau method according to Makkar et al. 5 Total tannin (TT) was determined after adding insoluble PVPP and reacting with Folin Ciocalteau reagent.9 Tannic acid was used to express TP and TT. The condensed tannins (CT) were measured by the HCL-butanol method.12 Hydrolysable tannins were analyzed using the Rhodanine assay,9 and results are expressed as gallotannin. where k refers to the fractional outflow rate of small particles from rumen. A value of 0.04 per hr for k was used. In vitro gas production analysis. Rumen fluid for the in vitro digestibility tannin bioassay was obtained from two healthy mature Gezel wether sheep of with live weight 34.00 kg (±1.50) were fed a daily ration 400 g lucerne, 300 g barley and 300 g soybean meal twice daily at 09:00 and 17:00 hours. where OMD is OM digestibility, ME is metabolizable energy; CP is crude protein in g per 100 g DM; XA is ash in g per 100 g DM; and GAS is the net gas production (mL).2 Net gas production data were converted from 300 to 200 mg after 24 hr of incubation. Statistical analysis. Data obtained from in situ and in vitro gas production was subjected to ANOVA as a completely randomized design with four replicates by the GLM procedure, and treatment means were compared by the Duncan test. The relationship between in situ CP degradability (ISCPD) with in situ dry matter degradability (ISDM), determined by linear regression using the PROC REG procedure of SAS (Version 8.2; SAS Institute, Carry, USA). Chemical composition. The chemical composition of PE is presented in Table 1. Crude protein content in PE was 11.30% that indicated PE was high in CP, also the results showed that PE was low in NDF content. In situ DM and protein degradability. Figure 1 shows the pattern of in situ CP and DM degradability of PE at incubation times. The disappearance of DM and CP increased with increasing time of incubation. After 96 hr of incubation, the CP and DM degradability for PE were 84.14% and 85.83%, respectively. Fig. 1. Pattern of in situ CP and DM degradability of PE in incubation times. Characteristics of the DM and CP in situdegradation of PE are given in Table 2. Soluble DM and CP (rapidly degraded fraction) for PE stood at 52.45% and 59.56%, respectively. Slowly degraded fraction of DM and CP were 40.11% and 23.55%, respectively. The relationship between in situ DM degradability and CP degradability is shown in Figure 2. There is a high relationship (r2 = 0.926; p < 0.05) in all incubation times. Fig. 2. Correlation between 48 hr DM in situ degradability and 48 hr protein degradability data from Pistachio epicarp. Fig. 3. Correlation between 48 hr in vitro gas production and 48 hr DM in situ degradability from Pistachio epicarp. In vitro gas production. The cumulative gas production is shown in Table 3. After 96 hr of incubation volume of produced gas in PE was 142.70 mL g-1DM. The addition of PEG increased gas production at all times of incubation (Table 3). Kinetics of gas production (a+b and c), ME and OMD were also increased by PEG incorporation (p < 0.05). The CP and TP contents of PE were similar to that reported by Mahdavi et al. while the NDF and ADF contents were lower than that reported by these authors.3 The amount of total phenol and total tannins for PB (9.13% and 7.90%, respectively) reported by Bagheripour et al. were higher than obtained values ​​for PE in this study.1 Generally, differences can be depended on the maturity stage, species or variety,13 drying methods, the condition environment,14 and soil type.15 Nitrogen, NDF and phenolic concentration suggest that PE have the potential to be used as feed supplements. There was a positive correlation between 48 hr gas production and 24 hr DMD data (p < 0.05, r2 =0.82), (Fig. 3). This is in agreement with finding of Rodrigues et al.19 but not with that of Blummel and Ørskov,20 who did not find any correlation between these parameters in barley and wheat straws. Kamalak et al. suggested that the relationship between these parameters varies with type of forage.21 The positive and significant (p < 0.05) correlation between in situ degradability and in vitro gas production data suggests that either method could be used to estimate nutritive value of such feeds. Previous experiments have shown a positive relationship between in situ degradability and both voluntary intake and in vivo digestibility10,22 as well as 24 hr in vitro gas production and metabolizable energy for ruminants from various forages.23 Khazaal et al.reported that in situ method should be used with caution when estimating the nutritive value of high phenolic feeds.24 The potential negative effect of phenolic compounds on rumen microbial fermentation is unlikely to be detected by in situ method. In this respect in vitro methods are more reliable in detecting inhibitory compounds in feeds. The in vitro gas production technique is a closed system with limited supply of rumen liquor where if there is any anti-nutritive compound, it is likely to affect the activity of rumen microbes. In conclusion, our results showed that the PE evaluated in the present study can be used for supplying part of protein requirements. The in situ degradability data suggest that PE have a high nutritive value. In vitro gas production of PE was increased when that combined with PEG. In order to further optimize PE use as a feed supplement, more in vivo studies are warranted. We would like to sincerely thank the members of Faculty of Agriculture, Tabriz University’s Research Council for funding this research. Bagheripour E, Rouzbehan Y, Alipour D. Effects of ensiling, air-drying and addition of polyethylene glycol on in vitro gas production of pistachio by-products. Anim Feed sci Tech 2008; 146(3): 327-336. Forough AN, Fazaeli H. Studies on the different methods of ensiling pistachio by-products. In proceedings: The third seminar of animal nutrition. Karaj, Iran 2005: 155-162. Mahdavi A, Zaghari M, Zahedifar M, et al. The effect of different feeding levels of dried Pistachio epicarp on fattening performance of Afshari lamb breed of Iran. J Agric Sci Natur Resour 2008; 15(5): 139-148. Besharati M, Taghizadeh A. Evaluation of dried grape by-product as a tanniniferous tropical feedstuff. Anim Feed Sci Technol 2009; 152(3): 198-203. Makkar HPS, Blümmel M, Becker K. Formation of complexes between polyvinyl pyrrolidones or polyethylene glycols and tannins, and their implication in gas production and true digestibility in in vitro techniques. Br J Nutr 1995; 73(6): 897-913. Silanikove N, Nitsan Z, Perevolotsky A. Effect of daily supplementation of polyethylene glycol on intake and digestion of tannin-containing leaves (Ceratonia siliqua) by sheep. J Agric Food Chem 1994; 42(12): 2844-2847. AOAC. Official Methods of analysis, 15th ed. of AOAC international. Maryland, USA: AOAC International 2005. Van Soest PJ, Robertson JB, Lewis BA. Methods for dietary fiber, neutral detergent fiber, and nonstrach polysaccharides in relation to animal nutrition. J Dairy Sci 1991; 74(10): 3583- 3597. Makkar HPS. Quantification of tannin tree foliage. A laboratory manual for the FAO/IAEA co-ordinated research project on use of nuclear and related techniques to develop simple tannin assay for predicting and improving the safety and efficiency of feeding ruminants on tanniniferous tree foliage. Joint FAO/IAEA, FAO/IAEA of nuclear techniques in food and agriculture. Animal production and health sub-programme, FAO/IAEA Working Document. Vienna, Austria: IAEA 2000. Ørskov ER. Protein nutrition in ruminants. 2nd ed. London, UK: Academic Press 1992; 51-58. Ørskov ER, McDonald I. The estimation of protein degradability in the rumen from incubation measure-ments weighed according to rate of passage. J Agric Sci Cambridge 1979; 92(2): 499-503. Menke KH, Steingass H. Estimation of the energetic feed value obtained from chemical analysis and in vitro gas production using rumen fluid. Anim Res Dev 1987; 28:7-55. Rittner U, Reed JD. Phenolics and in vitro degradability of protein and fiber in West African browse. J Sci Food Agric 1992; 58(1): 21-28. Kibont A, Ørskov ER. The use of degradation characteristics of browse plants to predict intake and digestibility by goats. Anim Prod 1993; 57(2): 247-251. Preston TR. The use of by-products for intensive animal production. BSAP Occasional Publication 1981; 4: 145-150. Tacon AGJ, Jackson A. Utilization of conventional and unconventional protein sources in practical feeds. In: Cowey CB, Mackie AM, Bell JG (Eds.). Nutrition and feeding in fish. London, UK: Academic Press 1985; 119-145. Makkar HPS. Effects and fate of tannin in ruminanat animals, adaptation to tannins, and strategies to overcome detrimental effects of feeding tannin-rich feeds. Small Rumin Res 2003; 49(3): 241-256. Khazaal K, Ørskov ER. The in vitro gas production technique: An investigation on its potential use with insoluble polyvinylpolypyrrolidone for the assessment of phenolics-related antinutritive factors in browse species. Anim Feed Sci Tech 1994; 47(3-4): 305-320. Rodrigues MAM, Guedes CM, Rodrigues AL, et al. Evaluation of the nutritive value of apple pulp mixed with different amounts of wheat straw. Livest Res Rural Dev 2008; 20(1): 1654-1659. Blumel M, Ørskov ER. Comparison of in vitro gas production and nylon bag degradability of roughages in prediction of food intake in cattle. Anim Feed sci Tech 1993; 40(2-3): 109-119. Kamalak A, Canbolat O, Gurbuz Y. Comparison between in situ and dry matter degradation and in vitro gas production of tannin containing leaves from four tree species. S Afr J Anim Sci 2004; 34(4): 233-240. Ørskov ER, Reid GW, Kay M. Prediction of intake by cattle from degradation characteristics of roughages. Anim Prod 1988; 46(1): 29-34. Barry TN, McNeill DM, McNabb WC. Plant secondary compounds; their impact on forage nutritive value and upon animal production. In Proceedings: the 19th international grasslands congress. Sao Paulo, Brazil: 2001; 445-452. Khazaal KA, Parissi Z, Tsiouvaras C, et al. Assessment phenolics-related antinutritive levels using the in vitro gas production technique: A comparison between different types polyvinylpolypyrrolidone or poly-ethylene glycol. J Sci Food Agric 1996; 71(4): 405-414.